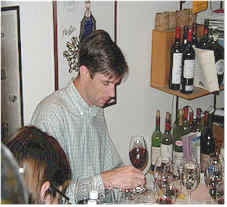 Growers and winemakers are singing the praises of the 1999 vintage. The cold winter allowed the vines to "sleep" until spring. The summer was quite cool, worrying some we'd see a repeat of 1998, a difficult vintage. At least some may have learned from their failed gambling the previous year and dropped some crop in an effort to assure the ripening of the fruit. I read one report saying that summer temperatures reached the 80 degree mark but once in 1999! A cool summer and mild September worried some. But Mother Nature came through in the last week of September and pushed many grapes to maturity. 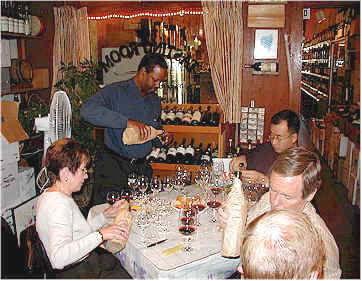 Winemakers credit the extended "hang time" with increased aromas and flavors. 8th Place: BEHRENS & HITCHCOCK 1999 "Oakville MERLOT"
This small producer probably picked at too high a sugar level, the wine being described by most people as "Port-like." One fellow described this as being "Turley-styled wine...somebody loves sugar. What is it, 16% alcohol?" In fact, the label states 15.2%. Another taster found it "Port like and raisiny." Someone else found "candied cherries, berryish and tart up front...hints of vanilla spice, bruised fruits and a toasty oak finish." Another encountered a "citrusy tang." My sniffer found deep and berryish aromas with hints of plum, blackberry, coffee/mocha and some cedar from the oak. Mild tannins on the palate, with a bit of berryish fruit. I gave it a one-star rating (3 star scale, no stars being a standard or average quality wine). "Supple texture with simple, minerally fruit notes and hints of green vegetables in the finish." was the assessment of one taster. Another agreed about the basic vegetal character of the wine, adding it has "nice structure." Someone else found this lacked aromatic and flavor interest, saying "It's completely uninteresting. There's nothing there." One lady said it's simply "Closed in and is a bit thin and tart with some herbal flavors." 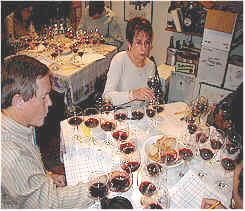 Another participant found it "pleasant, but not much on the palate." I found it lighter and simpler than most of the wines. The herbal and cooked veggie character is prominent on the nose, with a faint hint of stewed plums. Soft, simple and "easy," it has a touch of wood on the palate. Not profound, but not defective. I'd give it a half-star rating and wish it cost less. The first fellow to offer an opinion found "something burnt here...maybe a tobacco-like character I didn't like." Another person found it "smoky." Someone else found a "charred" quality to the wine, while someone else described it as "walnut." One found "spicy, sweet and complex notes with a lot of backbone." Another found "espresso coffee notes, with earthiness, currants and a toasted wood finish." Someone else said it's "Lavishly oaked with a lot of vanilla, a lot of mint and a long finish." Others said it's "straight-forward" and "more Merlot-like." My sense of the aromas included descriptors such as "sweet fruit, plummy, hints of cassis with nice oak and cedary fragrances." The same features shine brightly on the palate. Tannins are nicely balanced, suggesting a few years of aging potential. One-and-a-half stars. Many of the tasters noted a cola or cherry cola character in this striking wine. One fellow described it as "cherry-flavored cough medicine." Another person found this to be "hot and bitter, with raspberry notes and a burnt coffee element and some forest floor characteristics." One man said it reminded him of "almost-ripened black fruits and dark cola but the fruit dissipated on the finish." Another taster felt this was "big and clumsy." I found the fragrance to be wonderfully enchanting, reminding me of candied violets and black licorice. Some berry notes made it all the more complex. The black licorice flavors came through on the palate with a zesty, spicy feel. I thought five more years in the bottle might smooth some of the tannins. One-and-a-half stars. One fellow described this as being "citric and grapefruity." Another person found a note of "dusty white pepper with some chalky notes...Seems like it was over-pressed since it shows such bitterness." 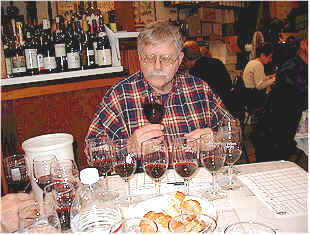 One taster with some winemaking experience said it showed him "oak tannins...mostly woody, gritty tannins. It's all structure and no stuffing." On a more positive level, a taster described it as "big, rich and elegant, with coffee notes, leather, sage and a lot of oak. It does have a bitter finish." Someone else felt it lacked acidity and would not be a good candidate for aging. I found lots of rather toasty oak here. It's woodsy, oaky and vanillin. The dark fruit flavors are nicely framed by all that lavish oak. Polished and deep. Several years of cellaring will soften the mild tannins. One-and-a-half stars. One critic felt this combined "tannic black fruit notes with oak, but tannin over-rides everything." But someone with a more positive view said they didn't find it terribly tannic, but "broad, voluptuous and easy to drink." Another taster found it "user friendly, with ripe red fruit notes like Santa Rosa plums...a hint of tobacco and a chili pepper spice." One person encountered a "metallic aspect that I had trouble with." One taster felt it became more bitter with time, while another marked it down for what they said was a lack of varietal character. I rather enjoyed the red fruit notes and the hint of a leathery, meaty quality (features which, in too deep a concentration are troublesome...here they added complexity). There's a nice hint of oak, too. The same leathery notes are present on the palate. The wine has a bit of tannin, not being made as a weak Cabernet or "vin ordinaire." Five to eight years of cellaring are, probably, possible. One star +. "Rough on the edges, with smoky, black currants on the palate and a nice mocha finish." said one critic. Another taster described the aromas as "weak, but it's strongly-flavored with a smooth, cherryish finish." Someone else found a note they described as "horsy," adding it has "low intensity aromas but roared back on the palate. Good complexity, too." I really enjoyed the fragrances wafting out of this glass. Lots of toasty oak, to be sure, but also nice plum, berry and other dark fruit notes. The same elements shine on the palate, with a modest amount of tannins. I pegged it as a five to eight year wine. Two stars+. "It's an unusual style," said one judge. "The wine shows French vanilla cream notes and butter, with a polished, black currant and anise character." Someone else found "slightly earthy notes with a touch of black cherry." One person described the fragrances as being reminiscent of "wet hay, cooked asparagus, green stems, chili peppers and it has a hot, astringent finish." Another person found this to be "over-ripe and yet thin...lacking fruit." I marked it down a bit for a jammy quality...it seemed like a warm climate or warm vintage wine. I felt the flavors were significantly better than the nose, showing creamy oak and lots of nice vanillin notes. Berryish fruit on the palate...tannins are balanced and poised for three to six years of cellaring. One-and-a-half stars.